The LONGBOW emergency operations pack has achieved legendary status in Conterra's fabulous line of EMS and rescue products. It was originally designed for the U. Air Forces Para Rescue Technicians. The Longbow is ergonomically designed with a vacuformed Kydex frame to ride like it's part of you, whether you are rappelling, skiing or crawling. 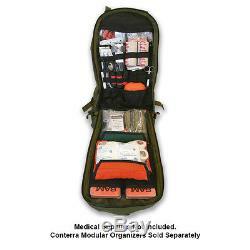 It has a large zippered medical supplies compartment which is separate from the main pocket. 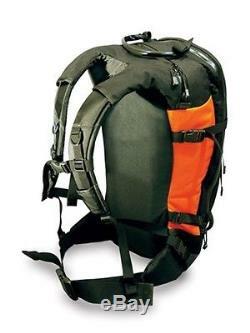 The Longbow is hydration-compatible and has numerous outside attachment points and ski carriers. Combine the LongBow with Conterra's Modular Organizers. 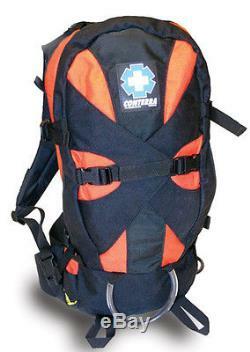 For further customization of your medical and SAR supplies. This is the perfect pack for search and rescue, ski patrol, or tactical operations where going "light and lean" is essential. Carries skis or snowboards better than any other pack we've seen. PACK ONLY CONTENTS NOT INCLUDED. The item "CONTERRA LONGBOW EMERGENCY OPS PACK SWAT BLACK (70-0650)" is in sale since Monday, March 06, 2017. This item is in the category "Business & Industrial\Healthcare, Lab & Life Science\Medical Specialties\Emergency & EMT\Other Emergency & EMT". The seller is "rescue-essentials" and is located in Salida, Colorado. This item can be shipped to United States.